I have sucessfully written my first QGIS processing toolbox. But have this bizzare optional tag on my parameters and i would like to remove these tags. Note that depending on permissions, you may need to save the file somewhere else, move/delete the original then move the newly saved on in its place. Restart QGIS and hopefully those tags should no longer appear when you run the script. Keep in mind that these parameters must now be filled as they are no longer optional. Not the answer you're looking for? Browse other questions tagged pyqgis qgis-processing toolbox or ask your own question. 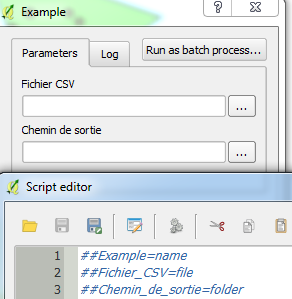 qgis-processing: how to specify optional outputs? Using Shortcut for QGIS Processing Script? Letting user choose from 2 options for QGIS Processing script input parameter?